Want cheaper car insurance? Better driving skills? The test takes about 90 minutes and you will be driving on all types of roads, from country lanes, dual carriageways, motorways (if possible) and town centres. It involves a test of your driving ability to cope with different conditions and environments. There are all types of hazards and situations that can occur whilst driving on our roads but with the training and guidance given by me, you will learn how to handle all these aspects with the main aim of driving with safety, within the legal limit and giving a smooth and safe ride. The person who examines you will be a serving or retired Police Officer, who holds a Police Advanced Driver Certificate Class 1. Recognising that the majority of collisions are caused by driver error the Advanced Driving Test in Aberystwyth has the specific objective of significantly improving driving standards. The tests are now recognised by the Driving Standards Agency (DSA). The Advanced Driving Test at the driving school in Aberystwyth is not exclusively about safety, but encourages the driver to feel confident on the road, to make good progress and to get greater enjoyment from the experience. The Advanced Driving Test at the driving school in Aberystwyth is not easy but with the right guidance it is within the reach of most motorist’s. Should you wish to take this test I will train you to reach the high standard required through my knowledge, skills and experience in having held a Police Advanced Driving Certificate Class 1. I would start with an assessment lesson, then discuss the number of hours training with you. Do you want to learn how to drive better? 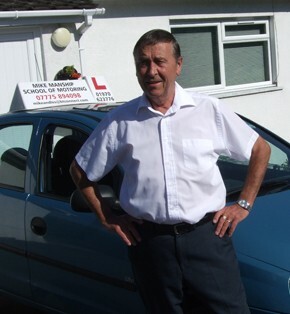 For booking and information call the Mike Manship Driving School in Aberystwyth on 01686 413202 or 0777 589 4098. Covering Aberystwyth and the surrounding areas.